Just like back in the Berkshires. 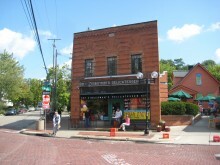 Ann Arbor is home to a great many restaurants. Of course, I may be a little biased and assume that they are all amazing, but when I found myself at Taste Kitchen, I was in new territory. You, back when I was a student Taste Kitchen didn’t exist. Plus, if it did it was definitely beyond my onetime student budget. It’s funny how a small college town can feel quite big when winter is so long and eating out is so much more money than a box of mac and cheese. (you need that money for beer, not food). So while I was a student at Michigan, I think I made it to Pita Kabob Grill once. 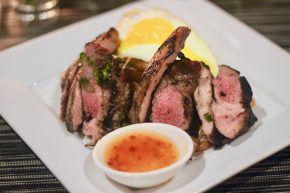 But upon my return to Ann Arbor recently, I found myself with someone who had glorious memories of that little Middle-Eastern hole-in-the-wall and so I doubled down on my visits. 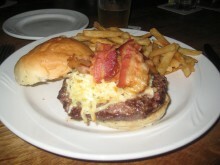 EDIT: Blimpy Burger has moved due to a rent dispute, but it is reputedly as good as always. After four years of living in Ann Arbor and countless other trips to the city of my alma mater, I have finally made my way to Krazy Jim’s Blimpy Burger. Although I always knew of the place while I lived there, I didn’t realize just how big of a deal it was until I saw it on Diners, Drive-ins and Dives. 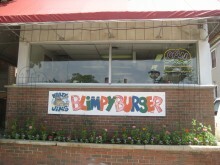 Since that time, it has been my goal to eat at Blimpy Burger and I can finally cross that place off of my list. But is it any good? I have never seen any spinach pie here. 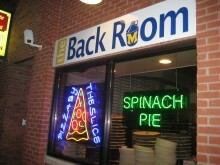 After failing to grab a late-night snack at Red Hot Lovers (if your damn sign says you are open til midnight, I better be able to show up at 11:57 and get a hot dog), we headed to Backroom Pizza. As a college student, this place was the best. Slices of cheese pizza were a buck and pepperoni ran 1.50. No one would ever claim it was great pizza, but at 2:30 am, you don’t need great pizza. Now that I’m no longer a poor college student, I was wondering if it would still have the allure it once did. After a fruitless attempt to grab lunch at Blimpy Burger, we had to think fast and find ourselves another quick place to eat in Ann Arbor. We decided that Pizza Bob’s would be a great option. Pizza Bob’s has been in Ann Arbor forever, but for some reason I never went while I was a student. Once inside, I decided I didn’t really need any pizza for lunch, but the calzone looked awesome. For $7.08 (wait, how much? 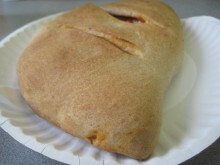 ), I ordered a calzone stuffed with pepperoni, sausage and meatballs. No need to order without veggies since I got to choose the toppings (innards?) myself. The guy at the counter asked if I wanted white or wheat dough, and I chose white.